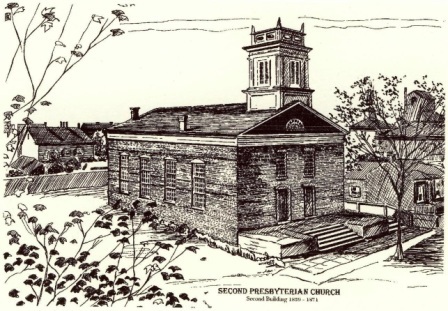 Springfield’s Second Presbyterian Church (now known as Westminster Presbyterian Church), was founded in May 1835, when 30 members of First Presbyterian Church split from the parent congregation. The 1837 question involved a proposal in Presbytery, the regional church governing body, to make slaveholding “a bar to communion,” Chapin reported. This resolution was opposed by both Dr. (John) Bergen (First Presbyterian’s pastor) and Reverend Dewey Whitney, then the pastor of the Second Presbyterian Church, and they agreed in supporting a milder resolution looking to the ultimate extinction of slavery. Local historian Richard Hart, however, says Second Presbyterian did gain a reputation as the “abolitionist church.” In the Summer 2006 edition of “For the People,” a newsletter of the Abraham Lincoln Association, Hart wrote that some Second Presbyterian members opened their homes to runaway slaves as part of the Underground Railroad. In his 1985 A Walk Through Oak Ridge Cemetery (updated in 2010 as Faith of Our Founders: Celebrating 175 Years of Ministry) Floyd Barringer was candid about the approach to faith taken by Second/Westminster’s original congregation. Second Presbyterian Church originally was housed at Fourth and Monroe streets. The drawing above depicts the second church building, which was in use from 1839 to 1871. The present Westminster church at Walnut and Edwards streets was dedicated in 1908. The church’s bell, however, dates from the 1840s. A virtual tour of Westminster Presbyterian’s imposing structure is available on the church website. Editor’s note: Thanks to Nancy Chapin for research assistance. This entry was posted in Abolitionism, Buildings, Churches and tagged Floyd Barringer, Richard Hart. Bookmark the permalink.